Akos from the radio for everyone blog (formerly known as the rtlsdr4everyone blog) has uploaded two new posts. On the first post he shows some further tests on the new FlightAware Prostick plus. The Prostick is an RTL-SDR that contains a built in LNA and the Prostick plus adds an additional SAW filter on the stick. For him the Prostick Plus works significantly better than the regular Protstick + external FA cavity filter and also gets about twice the ADS-B reception reports as our V3 which does not use an additional internal LNA. Next week we hope to release our own review of the Prostick Plus, and we’ll hopefully be able to show and explain why some people see better performance with the plus and why some instead see degraded performance. In his second post Akos shows a tutorial on building an easy helical antenna for Outernet reception. 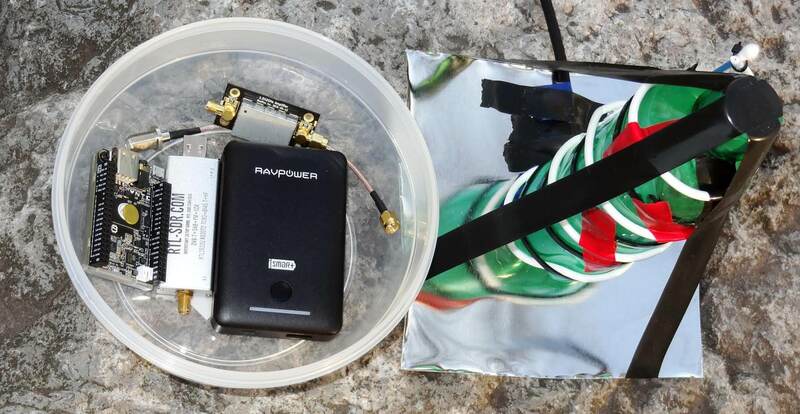 The antenna is constructed from readily available household materials such as a soda bottle, coax cable, electrical tape and a cookie tin. With the cookie tin used he was able to get a SNR reading between 7 – 9 dB, which is pretty good considering that only 3 dB is required for Outernet decoding to work. Outernet hardware plus the homemade helical antenna made by Akos. That’s cool that Akos is using a C.H.I.P computer for his Outernet receiver. Not bad for a $9 computer than runs Linux.